Still building upon on the buzz of their excellent 2017 debut, Loner, Austin anthemic, electro rock duo MISSIO return to town tonight, Feb. 20 to headline The Basement East, along with another buzzworthy and complimentary, though decidedly different, act, Cleveland blues rock outfit Welshly Arms, who broke out last year with their Legendary EP. Kicking off this eclectic bill is local singer-songwriter and prolific guitar collaborator Bones Owens, who’s been ramping up his solo appearances since last year’s Make Me No King EP. A diverse and well-rounded trio of acts, this is a rare chance to catch three performers at really exciting moments of musical ascent, and you can still grab tickets right here! Read on for more about the show. 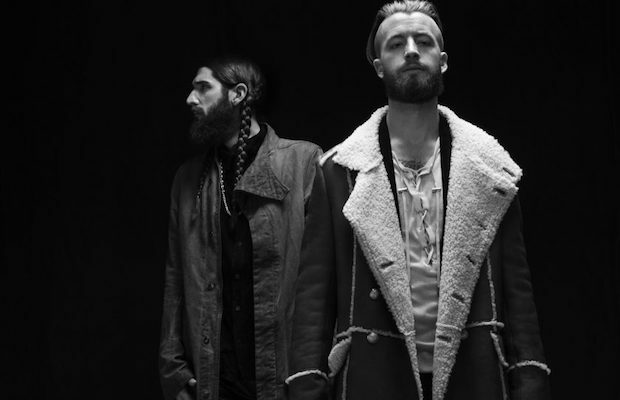 Hailing from Austin, Texas, the ascent of electro pop rock newcomers MISSIO has been a swift and deserved one. Formed in 2014, initially as a side project for singer and producer Matthew Brue, the band soon grew to include producer and multi-instrumentalist David Butler- both of whom were just coming off of other bands and, after casually crossing paths in the local scene over the years, found that they particularly clicked in the studio, even fortuitously becoming roommates as MISSIO’s lineup cemented. Adopting a strong DIY ethos (Butler built a home studio by hand, facilitating endless creative freedom), the duo were met with surprisingly fast online buzz after the release of their self-titled debut EP, and, after making their debut at SXSW and beginning to tour, were scooped up by RCA, who released their first full-length, Loner, last year. With radio and blog attention and some prominent placements, and propelled by buzzworthy tracks like “Middle Finger” and “Everybody Gets High,” the group’s hook-laden, synth-laced, unabashedly poppy, and refreshingly earnest sound has made them an exciting act to watch, and their return to Nashville comes at what still feels like the start of a long and prosperous career- next time around, we suspect they’ll be in a much larger room. Like MISSIO, Cleveland’s Welshly Arms are a relatively new act on a truly buzzworthy trajectory, already with three EPs and a 2015 eponymous full-length to their name. Formed in 2013 as impromptu jam session between friends, the band’s music has already provided the background to countless trailers, commercials, and TV spots, and they’ve brought their fantastic fusion of blues, rock, gospel, and soul and their energetic and inspired live show to prominent stages and festivals across the globe. It was last year’s Legendary EP, however, and the strength of its anthemic title track that has helped push Welshly Arms to a whole new plane of attention and exposure, and, as with the evening’s headliners, it feels like a particularly exciting time to catch them on their ascent. Though he is, perhaps, most visibly known as the longtime guitarist and collaborator for prominent local rapper YelaWolf, as well as other hip hop associations with the likes of Nashville staples Jelly Roll and Struggle Jennings, guitarist and singer-songwriter Bones Owens has collaborated with an impressive and expansive range of artists across many different genres over the years, serving as a co-writer, session player, live guitarist, and, more recently, a solo artist. Since the release of his latest EP, Make Me No King, an earnest, pleasant, soulful slice of straight up American rock, last year, Bones has been ramping up in live appearances, and though he (and, really the other two performers as well) is a bit of a weird fit on this bill, he’s no stranger to bridging gaps between genres, and has more seasoned performance chops than most anyone around. Get there early! MISSIO, Welshly Arms, and Bones Owens will perform tonight, Feb. 20 at The Basement East. The show is 18+, begins at 8:30 p.m. (doors at 7:30 p.m.), and tickets are available to purchase for $15-17.